Since the T12 lamps were phased out of production more than five years ago, many consumers wonder if they could substitute the T8s instead of buying an entirely new lighting fixture. 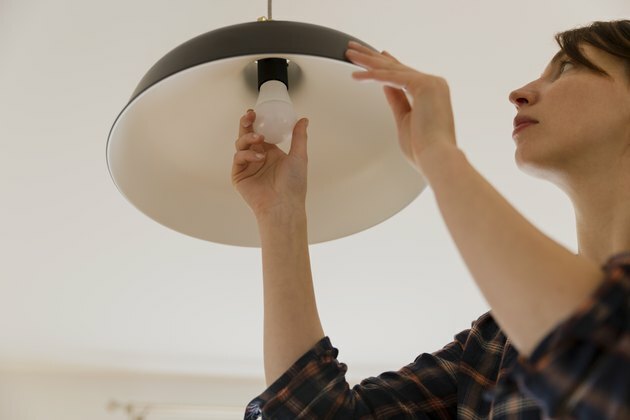 Although there are a few differences in each bulb, the two fluorescent bulbs have enough in common to be swapped out for most fixtures, with accommodations. Old fixtures can meet new safety and lighting standards to illuminate any space. The T in fluorescent lighting stands for "tubular." The number that follows references the diameter of the fluorescent tube in eights of an inch. Therefore, if you have a T12, it is larger by a half inch to the newer T8 tubes. However, the diameter is not as important as the bi-pin base. There are two main types of bases for bulbs: The screw base and the pin base. They both connect the light bulb to the electrical voltage in order for the tube to illuminate. Pin bases have two pins that stick out of the round base. They are used for HID light bulbs, plug-in compact fluorescent bulbs and linear fluorescents. They are preferred over screw bases in some cases because they snap in place quickly, whereas a screw base takes time in an uncomfortable position to install a fluorescent tube overhead. T8 and T12 both feature the same G13 bi-pin connector. The T8 tubes are slightly smaller at 1 inch in diameter, compared to the 1.5 inch diameter of T12 tubes. The T12 fixtures tended to use magnetic ballasts. T8 fluorescent bulbs are just as bright as the T12 – and much more economical. The T8 models cost almost half of the T12. If the room has less than 12 feet of height, a T8 can illuminate the space adequately. Color characteristics in T8s have improved dramatically so that the standard T12 with its larger tubes has become obsolete. The energy-efficient T8 lamps give a boost of lighting to any space. Convert a T12 fixture into the energy-saving T8 with a retrofit conversion kit. Turn off the power going to the fixture at the circuit breaker. Locate the ballast cover and pry it from inside the fixture by removing the screws or tabs. With wire cutters, remove the wires from the old ballast and remove the nut or screw that secures the ballast. A hot wire is usually covered in black and red, while a neutral wire is white. The white wire completes the circuit back to the electrical panel. Place the T8 ballast in the old fixture and secure the nuts and screws. If you discover a magnetic ballast, a separate starter device needs to be found and disconnected.